On a blackberry-tasting scale from one to ten, the marionberry ranks a 15. The Oregon born-and-raised berry can be best described as a cross between a raspberry and blackberry: tart, yet sweet, with a complex and earthy flavor. While most Oregonians use the beloved fruit in pies and jam, Ellenos pairs it with their velvety Greek yogurt. You’ll savor every spoonful. Stumptown Hair Bender Whole Bean Coffee - 12 oz. Wake up with this sweet and balanced coffee blend. very thick and yummy. best ever! This is the best yogurt! So happy I can buy it on here now! Delicious, creamy sweet treat! 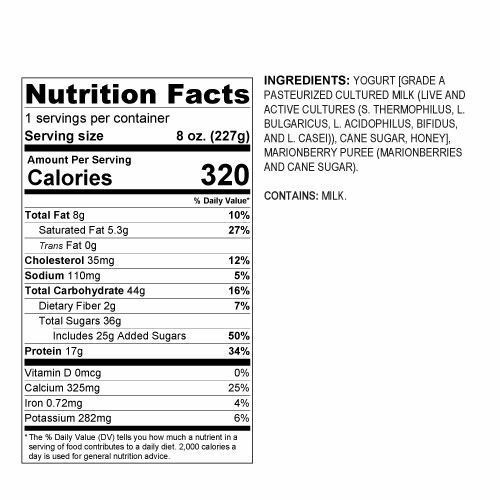 The yogurt is delicious with real fruit and tastes like dessert. It is wonderful and with only 320 calories but 17g of protein it keeps me full.